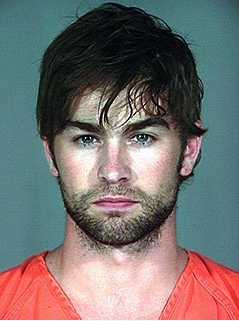 In the Gossip Girl books, Nate Archibald is sent to rehab after being charged with possession of marijuana. In real life, Chace Crawford's sentence is unknown. The actor was charged with one misdemeanor charge of possession of marijuana, which faces a maximum penalty of six months behind bars. I have a feeling Chace will get off - pretty boys don't have it easy in jail!